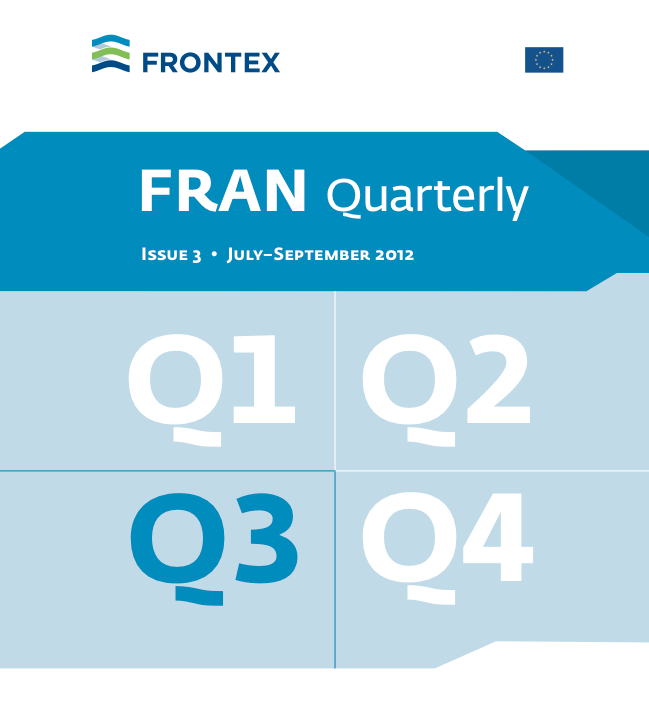 This summary is a follow-up to our previous post, which discussed the Frontex FRAN third quarter report for 2012. In May of this year, Frontex released its report for the fourth quarter (October – December) of 2012. (Frontex has since released its Report for Q1 2013; we will post a summary of this recent Report shortly.) During the fourth quarter 2012 several FRAN indicators varied radically compared with other reporting periods. First, there were only 13 613 detections of illegal border-crossing at the EU level- the lowest ever recorded figure for any quarter since data collection began in 2008. And for the first time since 2010, there were more detections at the sea borders (59%) , primarily in the Central Mediterranean, than at the land borders. In contrast to the reduction in overall detections of illegal border-crossing, both clandestine entries and asylum applications reached their highest levels by far, with Syrians ranking first among nationalities. Notably, Syrians submitted more asylum claims than any other nationality in this single quarter since data collection began. There were 13 613 detections of illegal border-crossing at the EU level, which is the lowest ever recorded figure since data collection began in early 2008. For the first time since 2010 there were more detections of illegal border-crossing at the external sea border (59%) than at the land border, which reflects the increasing importance of the Central Mediterranean route, and increased detections in the Aegean Sea in response to Greek operational activity at the land border with Turkey. the Bulgarian land border with Turkey, to where Palestinians and Syrians were increasingly displaced from the Greek land border with Turkey. More detections were reported by Italy than any other Member State, and more were reported from the Italian Pelagic Islands than any other border section. Somalis continued to arrive in Lampedusa in increasing numbers, but this development was overshadowed by a massive increase in the number of Eritreans arriving in Lampedusa and Malta from October onwards. In Q4 2012 there was an overall decline in the number of migrants arriving in the [Central Mediterranean] region mostly due to fewer North African nationalities such as Tunisians and Egyptians. However, there was a surge of migrants from sub-Saharan countries such as Eritrea, the Gambia and Mali, all of which were detected in much higher numbers than during the previous quarter – hence opposing seasonal declines expected at this time of year and observed for many other nationalities. In accordance with the ‘Processo Verbale’ of 5 April 2011 (an agreement between Italy and Tunisia on cooperation in the field of migration policy) in November and December 2012, Tunisian nationals were returned to Tunis or were recovered by the Tunisian authorities in international waters. 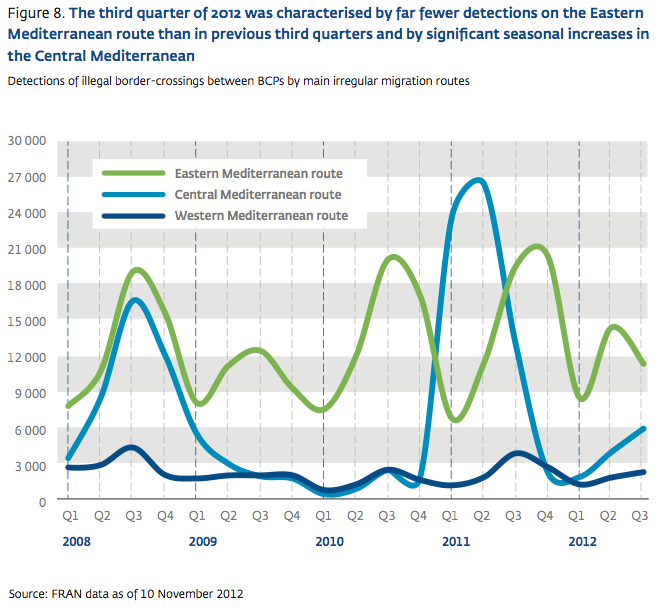 [In the Central Mediterranean,] [i]n contrast to decreased detections of migrants from North Africa, there were significant increases compared to the previous quarter, in detections of migrants from several sub-Saharan countries such as Eritrea (+200%), the Gambia (+90%) and Mali (+350%), as well as a steady and significant flow of migrants from Somalia, now ranked second in the region behind Eritreans. [T]he situation of the migration management by the Libyan authorities remains critical, both on land and at sea. There are still reports about extreme violence against black African nationals in Libya. Most of the migrants reported to have been beaten by Libyan police after being arrested and also by members of the facilitation networks. In Q4 2012 there were nearly 1 900 detections of illegal border-crossing in the Western Mediterranean region, which consists of several areas of the southern Spanish coast as well as the land borders of Ceuta and Melilla, where almost exactly half of all detections were reported. Going into the final quarter of the year there were vastly increased detections of migrants from Chad, Cameroon, Mali and Guinea arriving in the region of Cadiz. Asylum applications were at by far their highest level since data collection began in early 2008, with Syrians ranking first among nationalities, followed by Afghans. 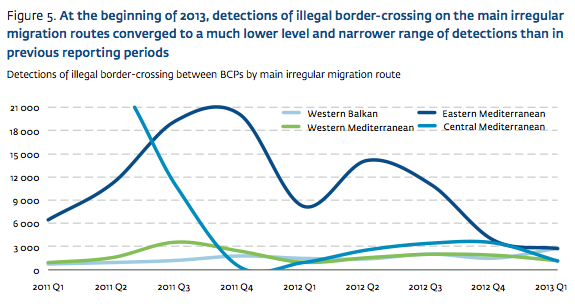 “Overall in Q4 2012 there were 13 613 detections of illegal border-crossing at the EU level, which was the lowest figure since data collection began in early 2008. The low number of detections compared to other quarters was due to vastly increased operational activity at the Greek land border with Turkey, where in recent years the majority of migrants were detected (operation Aspida, see next section). Reduced detections were also in part due to the overlapping effects of the end of the Arab Spring in its initial countries (Egypt, Libya, Tunisia) and far fewer detections of Albanian circular migrants detected illegally crossing the land border into Greece. 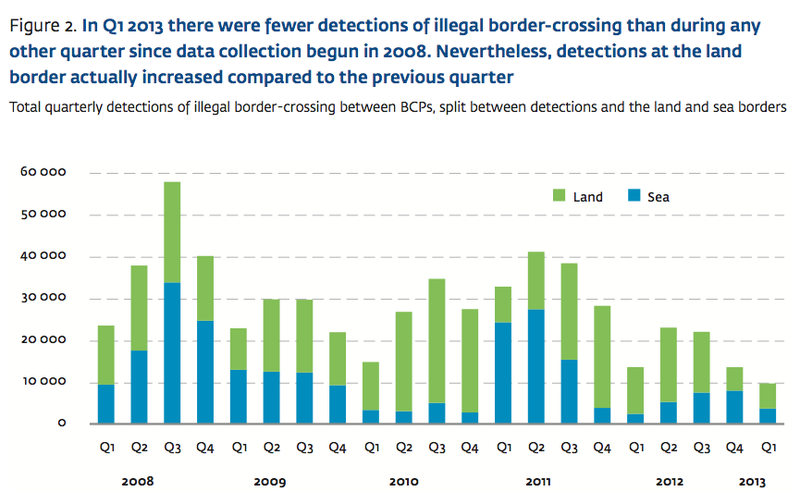 In Q4 2012, most (nine) Member States reported increased detections of illegal border-crossing compared to the same period of the previous year, albeit from relatively low bases (Fig. 3). For example, detections in Malta rose sevenfold, from Q4 2011 to Q4 2012, mostly due to increased detections of Eritreans, who also played a major role in doubling the number of detections in Italy compared to a year previously…. During the final quarter of 2012, the nationality with the fastest growing number of detections of illegal border-crossing in terms of absolute increase was Eritreans: up almost threefold from 352 in Q4 2011 to nearly 1 300 in the current reporting period. Detections of migrants from Mali increased more sharply but from a lower base: from 37 to 379 over the same period. In both cases, these migrants were almost exclusively detected in Lampedusa having left on small fishing boats from Libya. In recent quarters the most commonly detected have been migrants from Afghanistan, Pakistan, Bangladesh, Algeria and, more recently, Syria. In Q4 2012 the most commonly detected migrants in this region were from Afghanistan, Syria and Palestine but all in much reduced numbers than previously reported…. Italian Ionian Coast – For some time there has been a steady flow of Afghans and, to a lesser extent, Pakistanis arriving at the southern Italian blue borders of Calabria and Apulia, with some very large increases during Q3 2012. Apparently, many of them had been previously resident in Greece for several years, while some Afghan nationals claimed to have worked in Pakistan for six years, but due to the bad social and working conditions decided to return to Afghanistan and then to move to Europe to improve their economic situation. In contrast, in Q4 2012 other nationalities, such as Syrian, Bangladeshi and Egyptian, responded to the seasonal weather changes and were correspondingly detected in much lower numbers than during the previous quarter. The JO Aeneas 2012 in Apulia and Calabria started on 2 July and was extended until 2 January 2013. 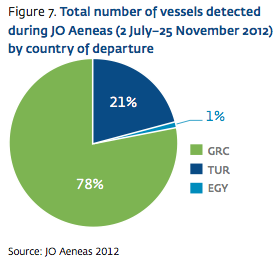 Overall, the percentage of incidents which involved departures from Greece was as high as 78% (Fig. 7). According to operational reports, the decrease in the number of arrivals in Apulia and Calabria from August 2012 was due the implementation of the Greek police operation Aspida stemming the flow of migrants. However, adding to the flow were Greek police operations against irregular migration in the centre of Athens and in other cities of Greece which continued to push irregular migrants out of Greece…. 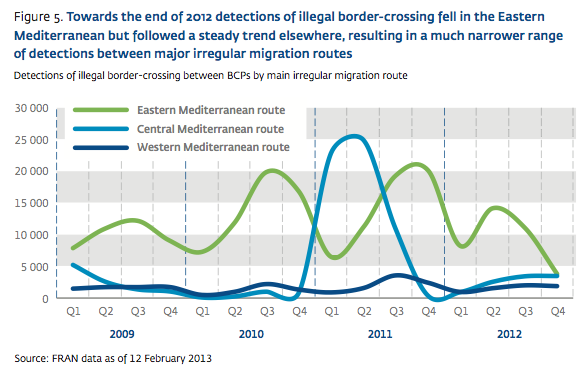 According to FRAN data, in Q4 2012 there were 3,476 reported detections of illegal border-crossing on the main Central Mediterranean route (Italian Pelagic Islands, Sicily and Malta), almost exactly the same number as in the previous quarter and significantly higher than any other quarter both before and after the Arab Spring. However, this figure concealed seasonal decreases for some commonly nationalities and significant increases for others. In accordance with the ‘Processo Verbale’ of 5 April 2011 (an agreement between Italy and Tunisia on cooperation in the field of migration policy) in November and December 2012, Tunisian nationals were returned to Tunis or were recovered by the Tunisian authorities in international waters. In 2012, Italian authorities delivered two patrol boats to the Tunisian authorities in order to improve the fight against the trafficking of human beings and irregular immigration. Consistent with declining numbers of Tunisians, detections of Egyptian migrants arriving in the Central Mediterranean region also fell, in this case from 287 in Q3 to just 135 in Q4 2012. In contrast to decreased detections of migrants from North Africa, there were significant increases compared to the previous quarter, in detections of migrants from several sub-Saharan countries such as Eritrea (+200%), the Gambia (+90%) and Mali (+350%), as well as a steady and significant flow of migrants from Somalia, now ranked second in the region behind Eritreans. Most of these migrants departed from Libya, where, due to a paucity of ground vehicles and boats, low technical and professional levels of the new police forces, the situation of the migration management by the Libyan authorities remains critical, both on land and at sea (Fig. 9). There was also a very large increase in the number of Syrians detected in the Central Mediterranean region from just five in Q3 to nearly 100 in Q4 2012, which is consistent with widespread increased detections of this nationality across border sections. However, there is currently no evidence to suggest that the Central Mediterranean area is likely to become the main point of entry for Syrian migrants. There are still reports about extreme violence against black African nationals in Libya. Most of the migrants reported to have been beaten by Libyan police after being arrested and also by members of the facilitation networks. The big Somali community in Abu Slim/Tripoli is the main gathering point for migrants originating from the Horn of Africa. From there, a second destination close to the beach is the final stopover before embarking the boats for the crossing to Italy. Some migrants reported that they got afraid when seeing the relatively small rubber dinghies and refused to enter them. Armed guards beat them and forced them to board the boats, not letting anyone leave. 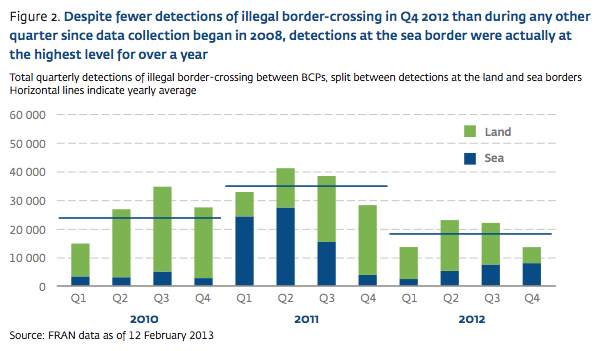 In Q4 2012 there were nearly 1,900 detections of illegal border-crossing in the Western Mediterranean region, which consists of several areas of the southern Spanish coast as well as the land borders of Ceuta and Melilla, where almost exactly half of all detections were reported. Going into the final quarter of the year there were vastly increased detections of migrants from Chad, Cameroon, Mali and Guinea arriving in the region of Cadiz. As has been the case for several years, the most commonly detected migrants were from Algeria, followed by migrants of unknown nationality (presumed to be sub-Saharan Africans), both of which were mostly reported from the land borders with Morocco. The JO Indalo 2012 started in this region on 16 May and ran until 31 October 2012 covering five zones of the south-eastern Spanish sea border and extending into the western Mediterranean. Consistent with previous years, the operational area of the JO Indalo continued to be affected by migratory flows mainly originating from North African and sub-Saharan countries, which follow a similar seasonal pattern. Overall there was a 4% decrease in the number of irregular migrants detected compared to the JO Indalo 2011. There were almost equal numbers of irregular migrants claiming to be from North African countries and the sub-Saharan region. According to the operational data, sub-Saharan migrants claimed to originate mostly from Chad, Guinea Conakry and Mali, whilst most of the migrants from North African countries claimed to be from Algeria and Morocco. 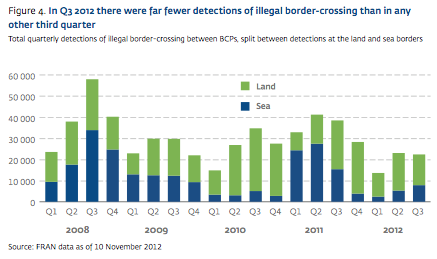 In the final quarter of 2012, there were just 91 detections of illegal border-crossing in this region, which is more than double the number reported during the previous quarter and goes against expected seasonal declines at this time of year. This increase was almost entirely due to migrants from the Gambia, who arrived in the Canary Islands in December significantly adding to the consistent but relatively low flow of Moroccans arriving in this area. Moroccan migrants were mainly young, lower-class, Arabic-speaking males who were undocumented to avoid repatriation. They arrived mainly in migrant boats targeting the Canary Islands. Click here or here for FRAN Q4 2012 Report. For previous 2012 FRAN Report summaries, click here (Q2) and here (Q3).